It was supposed to be a meeting of the National Executive Committee (NEC) of the ruling All Progressives Congress (APC), but it turned out to be much more than that. It became a forum for President Muhammadu Buhari to declare his second-term bid. Many at the meeting, which held at the APC secretariat in Abuja, were shocked as he declared his intention to seek re-election in 2019. 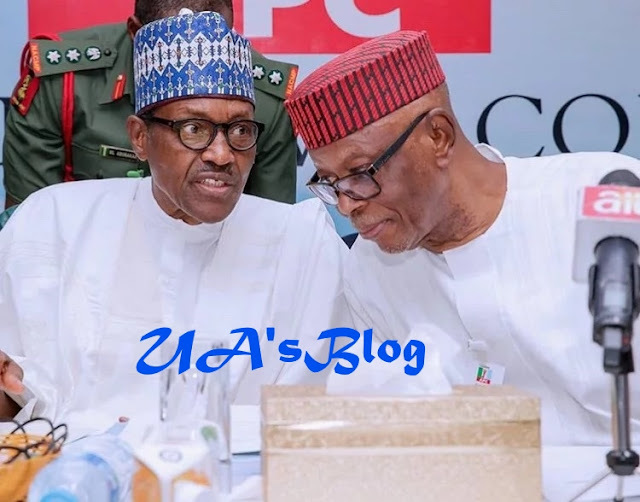 The meeting, which rejected tenure elongation for APC Chairman Chief John Odigie-Oyegun and other members of the National Working Committee (NWC), granted them waiver to recontest, if they wished. Present were Vice-President Yemi Osinbajo, Senate President Bukola Saraki, Speaker Yakubu Dogara, Governors Akinwunmi Ambode (Lagos), Ibikunle Amosun (Ogun), Rotimi Akeredolu (Ondo), Jubrilla Bindow (Adamawa), Simon Lalong (Plateau), Abdullahi Ganduje (Kano), Mohammed Abubakar (Bauchi), Abubakar Badaru (Jigawa), Kashim Shettima (Borno), Yahaya Bello (Kogi), Nasir El-Rufai (Kaduna), Aminu Tambuwal (Sokoto), Rochas Okorocha (Imo), Abdulaziz Yari (Zamfara), Tanko Al-makura (Nasarawa), Rauf Aregbesola (Osun), Atiku Bagudu (Kebbi), Abiola Ajimobi (Oyo) and Edo State Deputy Governor Phillip Shuaibu who represented Governor Godwin Obaseki. There was pin-drop silence as the President made his declaration, which he said was in response to the people’s clamour for him to recontest. A statement issued last night by his Senior Special Assistant (SSA) on Media and Publicity Garba Shehu quoted him as saying that he was reacting to the people’s wish. The statement reads: “President Buhari made the declaration at a closed-door meeting of the National Executive Committee of the All Progressives Congress. “Shortly before making the declaration, the President presented a speech on the report submitted by the APC National Executive Technical Committee. The Nation learnt that some excited NEC members started chorusing “Sai Kayi, Sai Kayi”(it must be you who should become the leader) after the President’s declaration. A source in the Presidency said: “None of us (the associates) expected it that the declaration for second-term bid will be done by the President at the NEC meeting. “All along, he had not been forthcoming on whether or not he will seek re-election. What we heard was that he disclosed his aspiration to very few people, including one or two ministers, to avoid leaks. “This is the second time in two weeks that the President will surprise some of us. At the last NEC meeting, he raised some constitutional issues against tenure elongation without giving us any inkling. “The NEC meeting was almost being concluded when the President shocked all of us. “Most NEC members, especially the critical stakeholders, were transfixed because the President never gave them the benefit of doubt. Those plotting against him in the party were left bewildered most. The President was said to have confided in a few kitchen cabinet members that he would seek re-election but kept the declaration plan to himself. It was gathered that he acted swiftly to avoid “leaks” on his plan. It was learnt that Buhari did not discuss his plans to make the declaration at the NEC meeting and refused to include it in his speech. Also, the NEC gave the National Working Committee (NWC) up till Thursday to release the party’s fine-tuned timetable for elective congresses and national convention. A governor said: “There was really nothing much to discuss because we spent a greater part of last week consulting with the President and reaching an agreement to jettison the tenure extension proposal. “Immediately we entered, the APC National Chairman, Chief John Odigie-Oyegun read an emotion-laden speech in view of the horse-trading of the past week. “The speech sounded valedictory because it drew sympathy for him but we had made up our minds to lay the tenure elongation ghost to rest. With the tenure elongation foreclosed by Buhari, there was intermittent shouts of “Sai Baba! Sai Baba!! Sai Baba!!! A member of the NWC also recalled how the session went after Buhari’s speech. A National Vice Chairman of APC moved the motion for the NEC to reverse itself on its February 27 decision to extend the tenure of the Oyegun-led NWC. He moved that the NEC should adopt the Lalong committee’s report. National Organising Secretary Osita Izunaso said based on the initial timetable for elective congresses and national convention, the party had fallen short of the deadline for notifying the Independent National Electoral Commission (INEC) of the dates for its congresses and convention. “The NEC directed that the organising department should work out new dates for the congresses and national convention that will be within the law on or before Thursday or Friday.